Britain’s largest business software company helps SMEs grow anywhere, anytime, any pace with the launch of Sage One Accounts Extra. Leading business software and services provider, Sage UK Limited, has today announced the launch of Sage One Accounts Extra, one of its most significant technology launches in the UK. 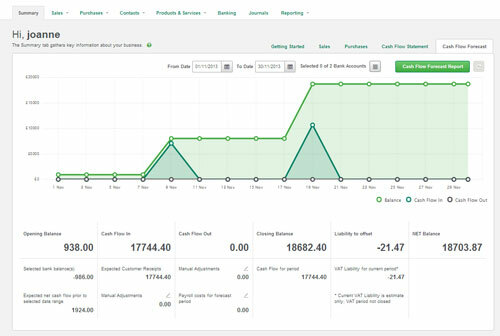 The new solution combines the deepest and broadest online accounting capabilities Sage has on the market for small businesses, providing customers with more power, visibility and control over the most important aspects of their financial affairs. Building on the success of Sage One Accounts and Sage One Payroll, Sage One Accounts Extra marks another major step forward in Sage’s growing online portfolio and is a direct response to the changing needs of small businesses and accountants in the UK and Ireland. Combined with Sage’s unmatched market knowledge and expertise, it also supports companies looking to expand overseas with foreign currency capabilities, and is delivered on a highly scalable and secure global platform built for greater accessibility and collaboration. As businesses increasingly want the freedom to choose how, where and when they access business-critical information, Sage One Accounts Extra provides an upgrade path from Sage One Accounts and gives customers the tools needed to grow in to new markets, operate more efficiently, and plan more effectively for the future. Customers will also have the assurance of free 24/7 telephone and email support from Sage’s award-winning customer service team, currently unparalleled in the market. 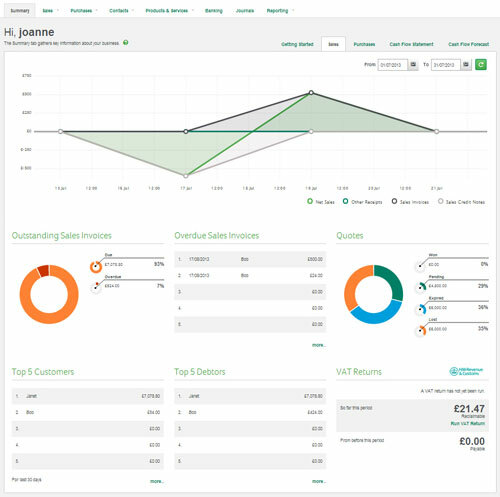 Key new functions for Sage One Accounts Extra include; enhanced forecasting tools, automated bank reconciliation, multi-currency and sophisticated cash flow management, additional functionality of invoicing, payments integration and importantly, support on all UK & Ireland VAT schemes. All of this, in addition to what Sage believes is one of the most intuitive and appealing interface and user experiences on the market today (see screenshots below). Free 24/7 support whenever it is needed, online and on the phone from the award-winning and UK-based Sage support team. Want to give Sage One Accounting a try? Sign up for a FREE, no commitment 30 day trial and pay nothing until you enter your Direct Debit details. Sage One sets the standard for online accounting and payroll software. Easy to use, jargon free and with simple pricing, within a couple of clicks you can work in real time with your accountant and connect to other powerful business apps. Support is included in the monthly subscription charge, so if you ever have a question, our UK-based support team are a phone call or email away 24/7, 365 days a year. With Sage One, you’ll have everything you need to manage your business, accounts and payroll, the easy way. Sage One requires no formal training and is easy to use. However, because everyone needs a helping hand now and then, free 24-hour support is available, either on the phone, via email or online, giving business users and accountants access to Sage’s unrivalled infrastructure of professional expertise and software support whenever they need it. The Sage Group plc is a leading global provider of business management software to small and medium sized companies, creating greater freedom for them to succeed. Sage understands how and why each business is unique. We provide products and services that suit varying needs, are a pleasure to use and are secure and efficient. Formed in 1981, Sage was floated on the London Stock Exchange in 1989 and entered the FTSE 100 in 1999. Sage has over 6 million customers and more than 13,380 employees in 23 countries covering the UK & Ireland, mainland Europe, North America, South Africa, Australia, Asia and Brazil. In the UK Sage has been helping small businesses improve the way they work for over 30 years with award-winning accounting, ERP, payroll, business intelligence and CRM software as well as services such as Excel Support, HR Advice, Health and Safety Advice and training courses. Best-selling packages such as Sage One Accounts, Sage Instant Accounts and Sage 50 Accounts have helped over 830,000 businesses in the UK save time and money. Congratulations guys and well done. im only sorry i wasnt there to see it go live!